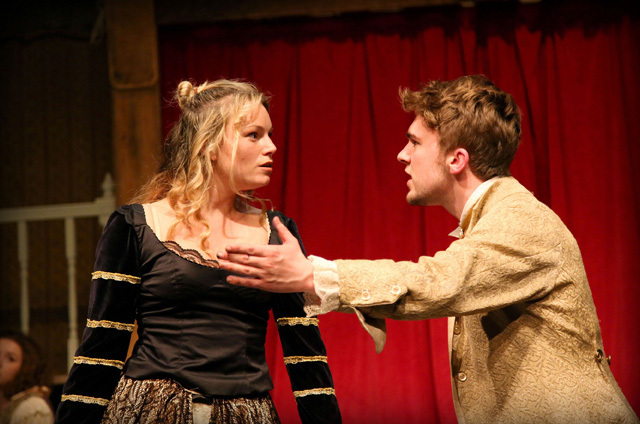 Nell Gwynn is Jessica Swale’s 2015 play about the famous English actress and mistress of King Charles II. Written originally for The Globe Theatre starring Gugu Mbatha-Raw with a subsequent West End transfer starring Gemma Arterton, this amateur production directed by Roger Beaumont brings heart (if not polished professionalism) to Blackfriars. Grace Wardlaw is simply charming as Nell. She easily carries the weight of the title character with ferocity, grace and always a cheeky look in her eye. Wardlaw will be snapped up by the West End very quickly if casting agents are paying attention. Having seen the original production, it’s not unfair to say Wardlaw gave original Nell – Mbatha-Raw a good run for her money. I can certainly see her playing Nancy in Oliver! in the not-to-distant-future. James Dart (King Charles II) has an excellent time swanning about the palace in tights, playing at royalty, and his relationship with Nell is sweet and touching. Simon Brooke is a gorgeously camp, scene-stealing Edward Kynaston. 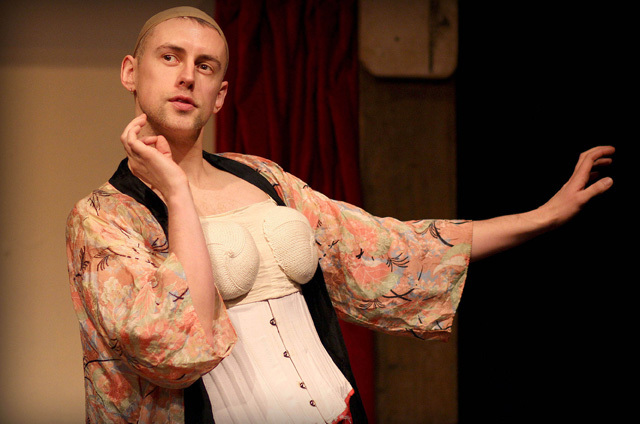 In kimono and wig-cap, Brooke’s comic timing and physicality leave him as an audience favourite. Felix Grainger is spritely and enthusiastic as tortured playwright, John Dryden. And Valerie Antwi comes into her own in the second act playing the comical serving lady and reluctant actress, Nancy. (Although, it did feel uncomfortable that the only non-white member of the cast was a servant, particularly given the original non-white casting of Gwynn in 2015). 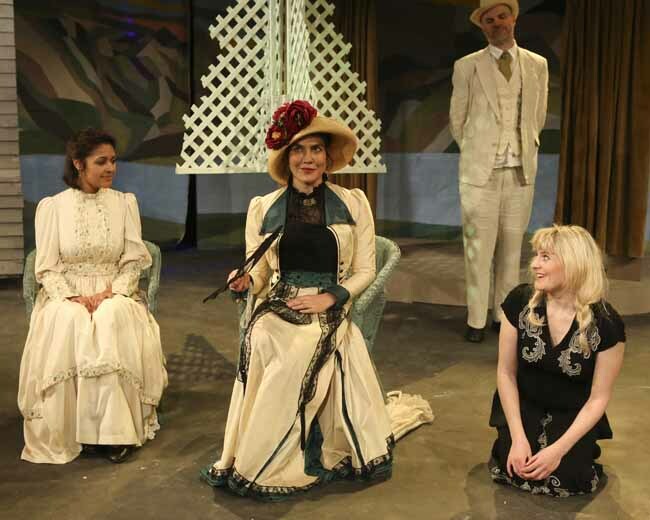 The show suffered from an unfortunately mistimed party above the venue, meaning quieter moments were lost in the background noise – a reminder that however good the acting, it’s often the venues that let amateur productions down. The action takes place over several locations around London meaning the ensemble/stage hands had their work cut out for them. Scene changes were sometimes slow, but were peppered with characterisation like ensemble member Alice Boorman getting increasingly frustrated picking up Dryden’s discarded pages. Director Beaumont also provides an elaborately designed set complete with Royal Box. I felt it would have benefitted from a simpler, stripped down set with additional lighting as the combination of the set and costumes felt too busy for a small stage. The live band led by Musical Director Jonathan Norris provided nice accompaniment in the musical numbers (particularly the catchy ‘I can dance and I can sing’), however some notes went astray as the show went on. This show was far from perfect, but like Ms Gwynn, it had charm, wit and gusto.